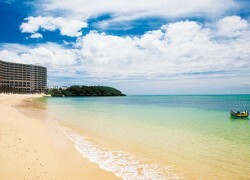 Sitting right in front of Hotel Monterey Okinawa Spa & Resort and immediately next to Fuchaku Beach, Tiger Beach is known for its pristine, unspoiled beauty with its stretch of pure white sand. While many of the beaches in Onna's resort area are privately owned by hotels and resorts, this beach provides an accessible and comfortable atmosphere for everyone. Together with the adjacent Fuchaku Beach, Tiger Beach is well liked by locals and is often filled with people looking to enjoy the sunset in tranquil surroundings. Fuchaku Beach, on the other hand, is a popular spot for walking the dog.